This last week has truly been a whirlwind of events, crazy weather and travel. After a super speedy trip to the West coast (more on that later), I'm dreaming of sunny days ahead. Here are a few finds to tide us over until Spring officially arrives. - March means Irish Soda Bread. Check this out to see if your favorite version is a true classic. - One my favorite childhood movies, The Sound of Music, just celebrated its 50th anniversary. While, of course, the singing is the star of the show, I always loved the incredible homes and grounds where the movie takes place, and the rolling hills surrounded by the Austrian Alps, feels very spring-y to me. Check this out for a glimpse into the movie's incredible filming location. This one is my favorite, and this is a close second! - I can't wait to host an Easter Brunch for the table top decor alone. Swooning over this tablescape, ok, and these sweet guys too. 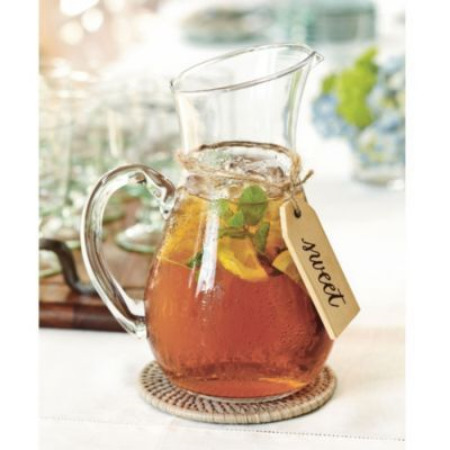 - Nothing says warm weather like a cold glass of iced tea. Today we're taking advantage of a few hours of sunshine to make sun tea. This step-by-step makes nailing the proportions super easy. - I couldn't be more excited about the Spring Suede movement. Need some inspiration? Check this out.